To adapt to this upward trend in remote work, learning and development professionals have been developing more on-demand remote learning strategies with Web-based technology for the past decade or so. But now, around 75% of companies want to increase their focus on social learning.2 And some experts are even saying that social learning will outperform remote learning altogether in 2018 and beyond.3 Continue reading to learn more. Essentially, social learning theory posits that people learn from one another via observation, imitation, and modeling. And in 2018, such social learning can easily occur remotely and online via social media channels, video conferencing, comment dashboards, mobile learning platforms, etc. 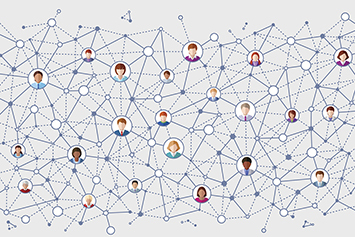 With recent innovations in technology and learning management platforms, there is no reason why more remote workers can’t use their Web-based platforms to advance and further their social learning. In other words, on-demand remote learning strategies can and should evolve to incorporate and include more examples of social learning—they aren’t separate things anymore. In fact, social learning in 2018 and beyond can include improvements upon existing remote on-demand learning courses and content. Now learners can do things like experience an online virtual reality environment with some of their cohorts or attend a live webinar or webcast with their peers remotely. They don’t have to physically be in the same location or even present at the same times to be able to learn from one another anymore. They’ll be able to share learning content with one another during or after live online events, answer one another’s questions in chat windows, and observe and model one another’s behaviors and learning methods in gamified and virtual reality environments. Succinctly put, social learning won’t outperform on-demand remote learning soon but will allow for it to evolve. com. Latest Telecommuting Statistics. Accessed 3/22/2018. eLearning Learning. Social Learning-The New Watercooler. Accessed 3/22/2018. The Top 10 Business Trends That Will Drive Success In 2018. Accessed 3/22/2018.